I started this painting the last time I was here, and continued today inspired by a painting by Doris McCarthy. Doris was mentored by the Group of Seven, and is close to 100 years old now. Today I went back to that spot on the Ottawa River and took several photos. It was raining on and off and the colours were just starting. 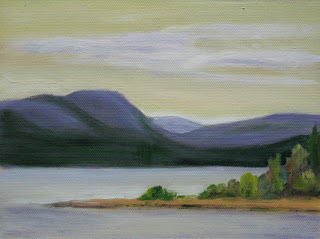 Hopefully a plein air day in this beautiful location will be possible this week.